Tribeca Metal Artwork is a select collection of hand-made industrial wall decor that unites accents of raw metal with brush painted artistry to forge amazing retro abstract and modern metal art. Perfect for adding a stylish, contemporary look to an urban loft apartment or to fill a wall in a public space, providing an exciting feature that will enthrall everybody. Meticulously made by hand, utilising the high skills of a metal worker with the mastery of an artist to create a masterpiece conveying the qualities of its subject. 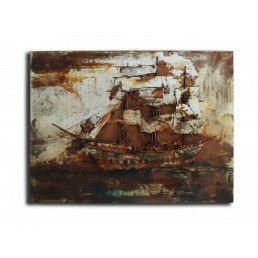 Industrially styled with vintage aged, rough edges and rust accents, these artworks have a reclaimed upcyled appeal. Some incorporate nuts, bolts and springs as components of the art, providing additional interest and texture. 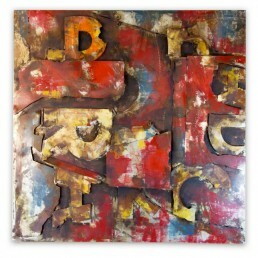 This industrial style Foundry Font wall art is a disordered mashup of metal letters portrayed as .. 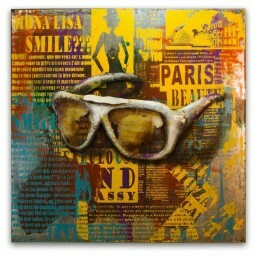 This "Retro Sunglasses" industrial metallic wall art oozes with French Riviera chic and features .. Featuring a stunning aged galleon with heaving sails. This historic moment has been strikingly de.. 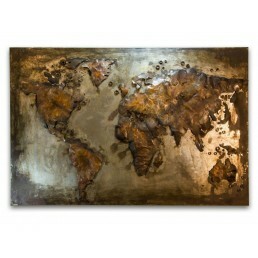 This Welded World metal wall hanging is an amazing abstract portrayal of the Earth. Featuring a r..